Necklaces are probably the most ubiquitous piece of jewelry there is. Many times, other than bridal jewelry, a necklace is the only piece of jewelry a woman is wearing. Girls start wearing pendants and necklaces well before rings or earrings. Even men will wear necklaces without being told to. We want to be a part of this. Whether a piece you wear every day or just on special occasions, we can create a unique look just for you. This custom awareness ribbon necklace can be customized for any cause. Just let us know what you want and we will make it happen. This was a project from a wax carving class. Initially, it was supposed to be a snake wrapping around a stone, but it didn’t end up that way! We don’t really know what to call it, but we like it. This is one of our custom Diamond and Gold name necklaces. 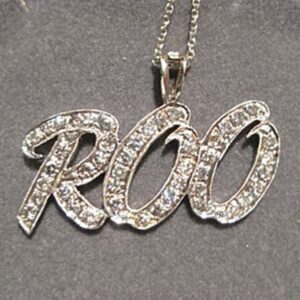 We can create custom necklaces with names or words in almost any font. We can also create draw letters as well. Just send us your idea and we will turn it in to a stunning custom jewelry creation. If you have one delicate, special necklace you wear every single day (even in the shower). Then you might not realize how many alternating, clear-cut trends the jewelry industry undergoes every year. But, one look to the runways and the necks of celebrities and you’ll see just how many different styles are being worn around people necks. Gone are the days when a simple drop was cool. Now, custom pendants are all the rage. Everyone wants something unique and personal to themselves. And we don’t blame them, because it is easier than ever to get your own custom pendant made just for you. Our Groovy Kitty Cat Necklace was a custom pendant made for a client with a record label of the same name. Custom Pendants are an excellent and cost-effective way to advertise your business. This Custom Star Necklace was set with gemstones purported to have healing characteristics and is a good representation of the colors that can be used in custom pendants. Similar to how we’ve seen dangling statement earrings rise in popularity this year, necklaces — and not just of the choker variety — are getting big. And in this case, more is definitely more. This piece below was 2.5 inches tall! We don’t recall the significance of this piece, but we used tapered sapphire baguettes to represent something in this nature inspired necklace. We don’t come up with this stuff: that is where you come in! Send us your idea for a custom necklace, no matter how odd. We will turn that vision into a stunning piece of custom jewelry. From new styles on personalized jewelry to big, oversized necklaces we haven’t seen since the early 2000s, the custom pendants bound to be dominating 2019 will be leaving moderation behind. Regardless of which styles you’re going to follow, one thing’s for sure: You’re going to start paying way more attention to what’s hanging around your neck. This logo pendant was made for a record label owner. Let us take your logo and turn it into a custom jewelry creation! They are great conversation starters and show people that you are successful. Do you have an idea for a custom necklace, but can’t find it anywhere? Do you have a name other than “John” or “Jennifer” and can’t find a name necklace with your name on it? You have come to the right place! We can create one of a kind custom pendants that you can’t find anywhere else. We also special in creating the jewelry you want, but isn’t made by the chain stores because it doesn’t have mass appeal. We can make all kinds of pearl necklaces. This one was an 8mm Akoya that we surrounded in a halo of diamonds and birthstones. There are a lot of possibilities with pearls, so send us your idea and let’s see what we can do. This Diamond and Topaz Sunflower Pendant uses the colors of the stones to achieve the desired look. Using the many colors offered by gemstones, we can create a wide variety of looks. In this 11 World Pendant, the colors of the diamonds form the ocean, Africa, and Asia. Gemstones are a great way to add color to custom pendants. We made a matching confederate flag wedding ring and pendant for a guy in Alabama who just loved him some dixie! This one was cast in Silver and we oxidized it to give it some contrast. Put beautiful a Custom diamond necklace around the neck of a loved one or even yourself! Design your custom pendants with our expert designer to show your unique style, celebrate an event, or tell a personal story. Whether you know exactly what you want or just have a very vague idea for a beautiful piece of jewelry, we can create and manufacture Custom Pendants that will blow your mind. We had a customer who called himself “Shorty Smooth”. We have no idea why. But we this 4 inch wide custom name necklace for him. Anything over 2.75 inches has to be cast in 2 pieces and soldered together. but, as you can see, you can’t tell. This “TRX” pendant is one of our hip hop style pendants. This is another style you are seeing more and more of. millennials love the pave diamond look and they are able to apply it to almost anything they can think of. We have crusted diamonds onto some odd things. But hey, that is what custom jewelry is about. We can’t recall what this was, but it turned out pretty cool. We especially like the tree. This is just a sample of what we can do though. Challenge us with something new! We had a customer who wanted a heart, but didn’t want one that looks like one you can get from the mall. He wanted funky, thin, and with some diamonds. This is what we cam up with. Trends and fashion change, but your name or nickname won’t. Whether it’s an initialed dog tag or a more minimalist take on the nameplate, you can proudly wear your name with custom pendants from Valeria Fine Jewelry. We can take almost any word or series of words and turn it into a custom necklace. We have hundreds of fonts we can use or we can even draw letters. As long as each letter is touching the next, we can make it happen. The “YF” pendant is just one of many custom pendants expertly designed by Valeria Fine Jewelry. “Young Family” wanted a gold and diamond name necklace. With Y and F. We came up with this configuration to blend the letters together. Using comprehensive CAD software, we are able to create designs digitally at first. Using this software, he is able to show you the design for your approval before it is manufactured. This way the customer can approve the design before casting them in a lost wax relief mold. The resulting Custom Pendants are stunning pieces of jewelry that you won’t find anywhere else. Our customer wanted a monogram pendant, but didn’t want the standard horizontal layout. The issue with cutout pendants is that each piece has to be touching more than just a little so the piece will be cast. It also helps with the durability of Custom Pendants. So we came up with an offset, vertical orientation that he loved. There isn’t anything special about this Obelisk Pendant. We just added some names and enameled them. But this is a good example of a piece of custom jewelry with a them not commonly used in jewelry. This is one of a few nameplate necklaces we have made. We can make these with almost nay name or word. Having a custom pendant made by Valeria Fine Jewelry is a much more personal experience than buying jewelry from a big box chain store. They go above and beyond to make sure each customer feels special and that his or her needs are all that matter. Consequently,Valeria Fine Jewelry will do whatever is required to make sure you’re so satisfied with your purchase that you keep coming back for more. Custom Pendants – Whatever You Want! This dagger necklace was based on a dagger from a video game. We oxidized the hilt and added enamel to her name. We have also made sword pendants. This pendant is the TARDIS from Dr. Who that we created for a huge fan of the show. It was cast in Sterling Silver, oxidized to turn it black, and then we polished the lettering at the top. We know what you’re thinking: my jewelry has to be on trend and in style, right, too? Technically, no. Custom Jewelry never goes out of style because it is personal and meaningful to the wearer. This makes it even more worthwhile to have custom pendants made. Custom Pendants – Give us a Chance! We understand that you have tons of options if you are looking for custom pendants. However, we are confident that if given the chance, our skill, service, and value will make us your go to jewelry designer for custom pendants. We have one of the few remaining master engravers local to us. So we are able to take standard pieces and take them to a whole other level. This Jesus Pendant was cast with just the cross and circle cut out. Everything else was hand engraved. Whether it is a $200 silver pendant or a $5000 dollar iced out hip hop necklace, we treat our customers as we would want to be treated. The biggest compliment you can pay us is to refer us to your friend and family. Or just buy from us again! We strive to offer the kind of service that warrants those actions with every project. The streamlined design and clean look of the ballet dancer pendant is just one example of Lucas’ talent, knowledge, and vision coming together to create an enchanting piece of jewelry that is as well made as it is beautiful. Custom Pendants – NOt all custom is equal! A gifted designer, Lucas possesses more than a creative eye and talent for jewelry making. His GG diploma from the Gemological Institute, hand fabrication skills, connections to reputable diamond and gemstone dealers around the world, and overall knowledge and insight into the world of jewelry makes him a trusted source for jewelry that is high quality and fairly priced. Google Valeria Fine Jewelry and you will find hundreds of 5 star reviews from happy customers. We aim to please and it shows in the feedback from our customers. This flaming skull necklace was created from a drawing made by a customer. There isn’t much to it, but we think it is cool. We can create pendants in one piece up to 2.75 inches wide or tall. Anything larger than that has to be cast in 2 pieces and soldered together. We can also cast things pretty small. This skull pendant was only a half-inch tall. From staple pendants in your everyday jewelry collection to specialty religious symbols of good omens and blessings to Superman Necklaces, we create unique custom pendants perfectly crafted for the true connoisseur. We also know that there are a wide variety of choices when looking for custom pendants. Most are not created as equal as others. And many don’t even really create custom jewelry. They send the job to someone else and then just charge a percentage for doing very little. We are quite confident that if given the chance, you will see that our expertise, knowledge, and value will put us a notch above the rest. Just google us! Evidence of our success is all over the internet. These were made for a couple who loved them some Minnesota Vikings. Despite the fact that we are die-hard Dallas Cowboys fans, we grudgingly created some pretty cool Custom Pendants for them. As you can see, no topic is off-limits for us! As long as the piece will cast and is legal, we will make it for you. We have had some requests we won’t post on here, so don’t be shy about contacting us with your idea. Click HERE to see more of our Custom Pendants. Click HERE to learn more about custom jewelry, to see our portfolio, or to contact us about Custom Pendants. It can cost less than you think to have your very own custom necklace or pendant made just for you. Why hassle with the retail stores for boring and overpriced neckwear?